Every shift counts. The sequential rev-limit indicator displays lights that indicate rising engine rpm. When you find the right rev range, an i-VTEC® light also flashes on, accompanied by more power from the engine. The Civic Si pays respect to its racing heritage with drilled-aluminum pedals. The performance-oriented, close-ratio 6-speed transmission is lightweight, compact and has a solid feel. It includes special features like close ratios for 1st through 5th gears, and a low final drive for faster acceleration. A stiff cast-aluminum transmission case helps reduce noise, while carbon-faced single-cone synchronizers on 5th and 6th gears enhance the shift feel. Finally, a low-ratio 6th gear provides a quieter and more fuel-efficient mode for highway cruising. 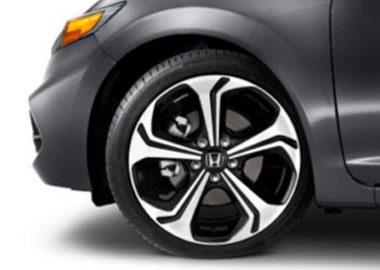 The Civic Si rides on stunning 18-inch alloy wheels. 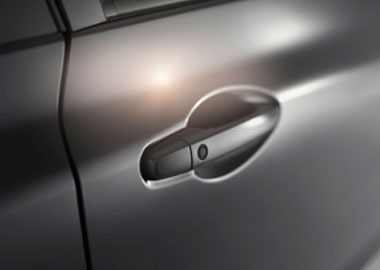 With Smart Entry, you can unlock and lock your vehicle without fishing for your keys. Whether you want to cozy up or cool down, the Civic Si Coupe makes it easy with an intuitive climate control system. Store important items in the spacious glove compartment. Take your drinks to go with convenient cup holders. Plug your compatible smartphone into the Display Audio interface to access your apps through HondaLink® Next Generation. Bluetooth® HandsFreeLink® comes standard on the Si. The 7-inch Display Audio touch-screen is your gateway to Pandora®, Bluetooth® audio and more. The latest generation Advanced Compatibility Engineering™ (ACE™) body structure is a Honda-exclusive body design that enhances occupant protection and crash compatibility in frontal collisions. The ACE™ design utilizes a network of connected structural elements to distribute crash energy more evenly throughout the front of the vehicle. This enhanced frontal crash-energy management helps to reduce the forces transferred to the passenger compartment and can help to more evenly disperse the forces transferred to other vehicles in a crash. The anti-lock braking system (ABS) uses a special modulator to pulse the brakes to help prevent wheel lockup. This helps the driver retain steering control when braking hard. The Electronic Brake Distribution (EBD) system balances the braking forces at each wheel according to how the car is dynamically loaded. Based on 2015 EPA mileage ratings. Use for comparison purposes only. Your mileage will vary depending on how you drive and maintain your vehicle.